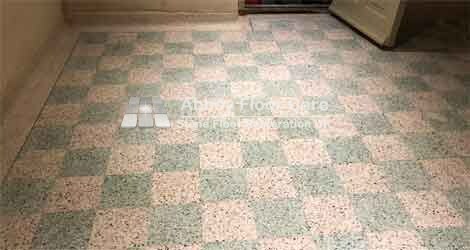 This 1960’s Terrazzo floor had suffered damage during the restoration of the building. After the restoration work, my client was really happy. Thank you so much for doing an absolutely outstanding job on our floor. It is beyond my hopes of what it might look like! I started by removing the thick cement deposits with 30 grit metal diamonds. Before grinding, I could see one area of damage. However, more damage was hiding under the cement deposits. 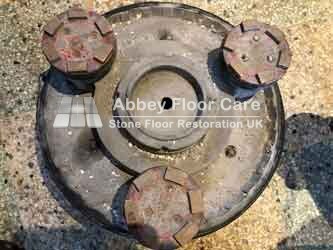 The grinding process exposed this additional damage. The damage was too deep to grind away the surface of the Terrazzo. So I filled the holes with 2 part resin filler. Used tape to account for the natural shrinkage in the filler. 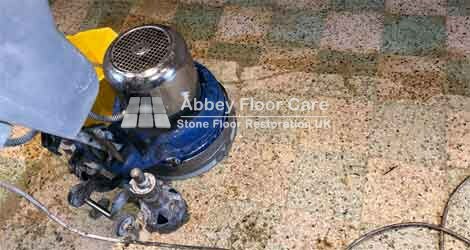 Once the filler cured hard, I ground the filler smooth to the surface of the floor. During the house renovation, the builders applied a thick layer of render to the walls. Unfortunately, they did not clean the cement residue off the Terrazzo skirtings. So I used hand grinding to remove the cement. After completing the grinding, honing and repair work, I cleared the work area. Then I thoroughly rinsed the floor ready for sealing. I applied a high quality impregnating sealer to help protect the floor and make the floor easier to clean. 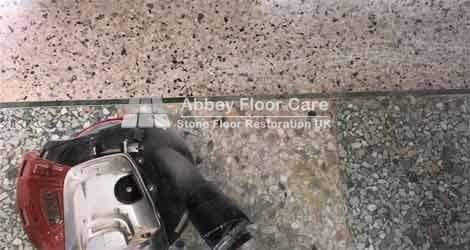 I explained that an impregnating sealer would not prevent acid spills from etching into the surface of the Terrazzo. 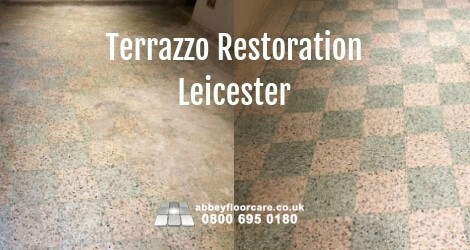 My client was delighted with the results of the Terrazzo Restoration Leicester LE7 project. 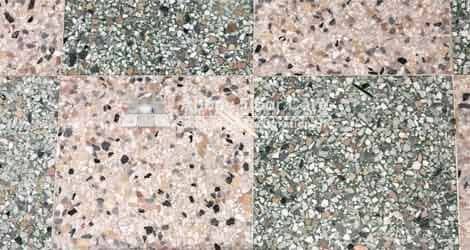 Terrazzo floors are durable easy to clean. 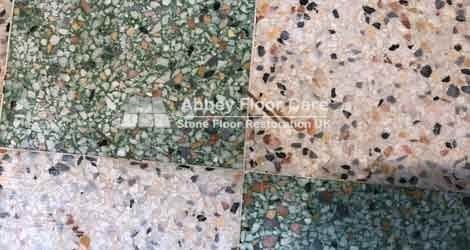 To keep the original appearance, follow these simple steps to keep a beautiful, long-lasting Terrazzo floor. 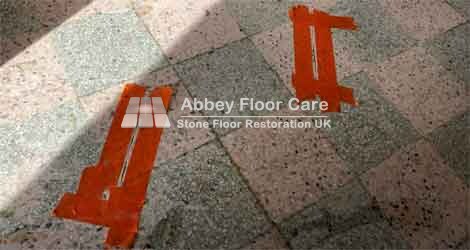 Remove spills quickly, to stop acid spills etching the floor. 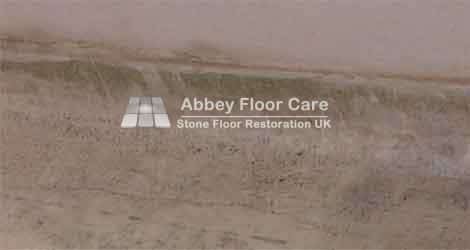 Remove stubborn sticky soil, with a palette knife. Vacuum or dry sweep the floor with a microfiber dry mop. 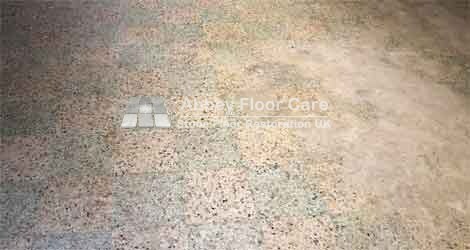 Damp mop with a Terrazzo cleaner, such as LTP Waxwash. We Will Be Happy To Help?